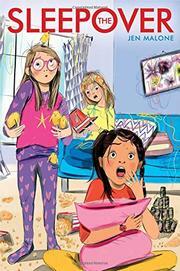 Friends Meghan, Anna Marie, and Paige are eager to have a memorable sleepover. For 12-year-old Meghan, celebrating her best friend’s 13th birthday is the perfect opportunity for her first stay-the-whole-night sleepover. Despite the unexpected arrival of Anna Marie’s quirky, almost-stepsister Veronica and the interference of Anna Marie’s younger brother, the friends forge on. However, Veronica’s unusual birthday present—a session with a hypnotist—dramatically alters their evening. Malone quickly segues from the girls’ hypnosis session with Madame Mesmer to the following morning, when Meghan awakens without any recollection of the rest of the evening—and Anna Marie is gone. Meghan is determined to unravel the mystery of her missing memories. Told from Meghan’s perspective, Malone’s tale maintains a swift pace as the girls frantically try to figure out what’s happened. As the group becomes embroiled in mischief and mishaps, the initially very cautious Meghan undergoes a subtle transformation. In the chaotic aftermath of the sleepover, she does many things she would never have attempted previously. Reveling in this bolder, slightly braver aspect of her personality, she stands her ground and closely collaborates with her crush, Jake. With inventive plot twists and surprise revelations, Malone resolves the crisis, neatly providing explanations for the strange turn of events. Meghan and Paige are white; despite Anna Marie’s Latino last name, she demonstrates no cultural specificity.